Collecting 3 Graphic Novels in 1! 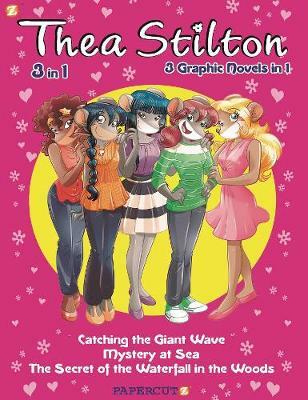 The Thea Sisters--Pamela, Colette, Violet, Paulina, and Nicky--are five fun, lively students at Mouseford Academy on Whale Island, who, inspired by famous journalist Thea Stilton, want to be real, live journalists. Between classes and friendships, love and small fits of jealousy, they find life at the Academy to be a never-ending Adventure! Join the Thea Sisters for a thrilling school year at Mouseford Academy as cosmetics queen and industrialist Vissia De Vissen enrolls Vic and Vanilla, her two children, at the school. At the same time, a rouge orca is causing chaos on the shores of the island. Are the two events connected? Plus, Election Day draws near as the campaign trail turns competitive. Can Vanilla cheat her way into the presidency of the Lizard Club or can the Thea Sisters win fair and square? And, Whale Island's mysterious Viking ancestry has been uncovered. Does a legendary treasure come with it? Vanilla and her mom, Vissia, will stop at nothing to find out!